Ep 6, Season 3, Comparison, Harley-Davidson LiveWire v. Zero Motorcycle SRF, Electric Motorcycles In this podcast, Jon, John, and Mark compare and contrast the Harley-Davidson LiveWire and the Zero SR/F. Both are fantastic electric motorcycles though the Harley is clearly aimed at those looking for a premium EV experience while the Zero is more value oriented. That said, similarly equipped examples of both are closer in price than you might think. The discussion focuses on Price, Range, and Components. A lot still remains to be seen and many specs are simply unavailable at this point in time. John gives a special shout out to one of our negative reviewers on Itunes. Tune in to learn more. https://www.harley-davidson.com/us/en/motorcycles/future-vehicles/livewire.html https://www.zeromotorcycles.com/ Thank you to our Sponsor, Wilkins Harley-Davidson, www.WilkinsHarley.Com As always, we would love for you to review our Podcast on whatever platform you listen to. John and Mark host a mysterious caller who goes by the singular name- Lefty. Lefty expounds on how he sees motorcycles as a social good that brings diverse people together and reduces our carbon footprints. He also claims to be able to tell the difference between how Kentucky Horse Manure and Pennsylvania Horse Manure smell. Driving a Car is just about mailing yourself safely from one place to another when you can't ride your motorcycle. Is it okay to ride your motorcycle to church? Muffler Mikes Plea for Quiet Riding. As always, we appreciate you listening. We would love it if you rated our Podcast. While a 5 star is amazing, we view all feedback as a gift. 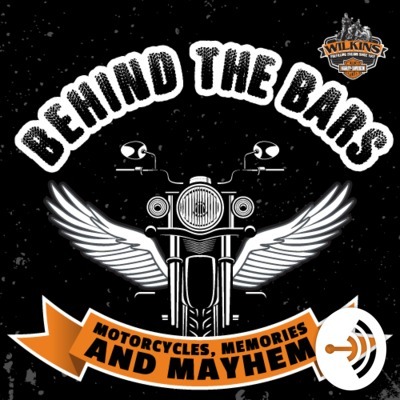 Jon "The Eagle" rejoins John and Mark for a lively end of season Behind the Bars podcast. This one features plenty of free-spirited banter about a Hodge podge of subjects including Mark's growing relationship with the FXDR114, how motorcycles were used in World War II, a wonderful philanthropic gesture by a Black Hills Harley-Davidson, Darwinism, and news on the most recently retired H-D models. Thanks to all of you who continue to listen and support this Podcast. We would certainly appreciate a review and a suggestion. John and Mark catch up with Brock St. Clair- one of the eight H-D Freedom interns. From taking Riding Academy to riding 15,000 miles this summer, Brock wasted no time. Brock's inspired us with his willingness to face fears and just go for it! His instagram page is a perfect place to watch as he chronicles the challenges from learning to ride to traversing the country. #FindYourFreedomIntern #WeBuildRiders Brock's Instagram: @dont_brock_the_boat Youtube Channel: https://www.youtube.com/channel/UCTn_jFcodBMRyIZRdhxmL6Q We would sincerely appreciate it if you subscribed and rated the Behind the Bars Podcast on whatever platform you use. It allows us to continue to produce this without asking for money from sponsors, well, other than Wilkins Harley-Davidson. Robert Pandya, former PR Manager for Indian and Victory.